Beginning as a radio sports announcer, Ronald Reagan enjoyed success as a movie actor and television personality before beginning a political career. After two terms as governor of California (1967–1975), he defeated Democrat Jimmy Carter (1924–) for the presidency in 1980 and was re-elected in 1984. Born on February 6, 1911, in Tampico, Illinois, Ronald Wilson Reagan was the second son of John Edward ("Jack") and Nelle Wilson Reagan. His parents were relatively poor, and Jack Reagan moved the family to a number of small Illinois towns trying to establish himself in business. When Ronald was nine the family moved to Dixon, Illinois, where he grew to adulthood. Nicknamed "Dutch," young Reagan liked solitude but was popular. He enjoyed nature, reading, and especially sports. His father's alcoholism caused problems at home, but his mother was a powerful force for stability. As a teenager and young man, Reagan gained fame for his accomplishments as a lifeguard, rescuing seventy-seven people during the summers of 1926 to 1933, while working in a park along Illinois's Rock River. (Reagan also dove into the river to "save" one swimmer's dentures from the river bottom—for which he received a ten-dollar tip.) Reagan graduated from Dixon High School in 1928 and enrolled the following fall at Eureka College, a small Illinois school affiliated with his mother's church. He graduated from Eureka in 1932. Graduating in the middle of the national and world economic crisis known as the Great Depression (1929-39), Reagan eventually found a job in Davenport, Iowa, as a sports announcer for a radio station. His skill soon earned him a position at WHO in Des Moines, Iowa. At the station one of his chief duties was to reconstruct Chicago Cubs baseball game broadcasts from reports sent by telegraph (a communication device that uses coded signals to send messages). In 1937 Reagan persuaded WHO to send him to cover the Cubs' spring training games in California. However, his real motive was to try to launch an acting career in Hollywood, and he was soon appearing in the movies. As an actor Reagan received decent reviews, but not especially good roles. In 1940, however, he landed a role that made him famous, playing college football star George Gipp in the movie Knute Rockne—All American. In January 1940 he married actress Jane Wyman (1914–), with whom he had a daughter and adopted a son, although another infant born to them died in June 1947. The marriage began to fail shortly thereafter, and Reagan and Wyman divorced in June of 1948. Part of the cause for the divorce was apparently Reagan's near-obsession in the late 1940s with the business of the Screen Actors Guild. He was president of the guild, which is the labor union for movie actors, from 1947 to 1952, and again in 1959. During this time he also became well known for his strong anticommunist views. Meanwhile, his own acting career began to falter, as he was offered a limited range of roles. Personally, however, he achieved happiness with his marriage in March 1952 to actress Nancy Davis (1921–). The couple had two children. Disappointed by his diminishing movie opportunities and financially pressed, Reagan soon turned to television. Signed by the General Electric (G.E.) company in 1954 as the host of the company's weekly half-hour dramatic series, General Electric Theater, Reagan was a TV success. Taking advantage of Reagan's popularity, G.E. insisted that he go on personal appearance tours, speaking at G.E. factories. Within a few years, he perfected "the speech": a salute to private enterprise with an "anticollectivist" (anticommunist) message, combined with a sales pitch for G.E. products. In 1962 Reagan formally registered as a member of the Republican Party. He began to plunge full time into political activities. He captured national attention with a speech supporting Republican presidential candidate Barry Goldwater in 1964. By early 1965 a group of prominent California conservatives (people who resist change and prefer to keep traditions) decided Reagan should run for governor of their state. Benefiting from massive financial support, shrewd campaigning, and a strong conservative trend among California's voters, Reagan easily won the Republican primary. Running against Democratic governor Edmund G. (Pat) Brown (1905–1996) in the general election, he won with 58 percent of the vote in 1966. Reagan took immediate, dramatic action as governor, approving sweeping cuts in the state's budget and a freeze on additional hiring for state agencies. He also raised state income-tax rates. Reelected in 1970, he established a reputation for sound financial management and pressed for reform of the state welfare system, tightening the requirements applicants needed to meet in order to receive aid from the state. During his first term Reagan made an energetic run for the 1968 Republican presidential nomination. He did not win the nomination, but his campaign established him as a future presidential possibility. In 1976 he gave Republican president Gerald Ford (1913–) a hard but unsuccessful race for his party's nomination. 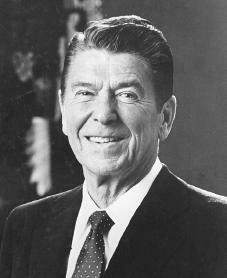 Reagan then became his party's leading candidate for the 1980 Republican nomination. After announcing his candidacy once again in late 1979, Reagan campaigned aggressively as a strong conservative. His masterful performance in a televised debate with President Jimmy Carter (1924–) sealed his victory. In November 1980 Reagan became the nation's fortieth president. His election was viewed by many as a "new beginning," as the Republicans also won control of the Senate. Day O'Connor (1930–), he kept most of his conservative following by sticking to his goal of reducing taxes and increasing defense spending while also reducing spending for social programs. In 1981 Reagan persuaded Congress to pass a large, three-year reduction in income-tax rates, even though federal deficits were more than $100 billion per year. The issue of deficits—spending that exceeds revenue—continued to trouble the Reagan presidency. Reagan's skill in handling the media earned him the nickname the "Great Communicator" and allowed him to become the spokesman and symbol of the political movement that elected him. However, his actions as president were not always as aggressive as his words. Although he darkly referred to the Soviet Union as "evil," he ended the Carter-imposed halt on grain shipments to that country. He committed a large number of U.S. Marines to help keep peace during the civil war in the Middle East nation of Lebanon, but he removed them after an attack against them led to 240 American deaths. By 1984 Reagan appeared difficult to beat for re-election. In the November polling, he defeated Democratic challenger Walter Mondale (1928–) easily, with 58 percent of the popular vote. After winning re-election, Reagan continued to talk tough concerning the Soviet Union, but he also worked to pursue an agreement with the country to limit weapons. Meetings with Soviet leader Mikhail Gorbachev (1931–) in 1985 and 1986 accomplished little toward that goal, however, and Reagan pressed ahead with an aggressive program of national defense. Meanwhile, economic problems at home did not improve, as the deficit continued at record-high levels and the nation continued to import more than it exported. In addition, in late 1986 Reagan ran into serious problems due to the "Iran-contra" scandal. This scandal involved a secret sale of arms to Iran, apparently to gain the release of American hostages held by terrorists in Lebanon who supported Iran. The profits of the sale were directed towards aid to the "contras"—forces struggling to overthrow a socialist government in Nicaragua. Congress, however, had banned such aid. Congressional hearings on the scandal captured headlines throughout 1987, revealing significant misstatements by Reagan and apparent misuse of power by some in his administration. As Reagan's second term drew to a close, it was clear that he had not accomplished the conservative "revolution" predicted in 1980. However, an important part of his legacy was the increased conservatism of the Supreme Court. Reagan's appointment to the court of justices O'Connor, Antonin Scalia (1936–), and Anthony Kennedy (1936–), along with the promotion of William Rehnquist (1924–) to the position of Chief Justice, had moved the court strongly to the right. After his return to private citizenship in 1989, Reagan continued to be a popular and active public figure. By the mid-1990s, however, Reagan had been diagnosed with Alzheimer's disease, an ultimately fatal degeneration, or breaking down, of the central nervous system. As his condition deteriorated, Reagan withdrew from public appearances. Throughout his presidency, Reagan maintained a hold on the public's affection unequaled since the presidency of Dwight Eisenhower (1890–1969). Many would agree that Ronald Reagan, however history might judge his presidency, possessed a gift for inspiring the American people with his speaking style and personality. Blumenthal, Sidney, and Thomas Byrne Edsall. The Reagan Legacy. New York: Pantheon Books, 1988. Cannon, Lou. President Reagan: The Role of a Lifetime. New York: Simon & Schuster, 1991. Reprint, New York: Public Affairs, 2000. Judson, Karen. Ronald Reagan. Springfield, NJ: Enslow, 1997. Noonan, Peggy. When Character Was King: A Story of Ronald Reagan. New York: Viking, 2001. Pemberton, William E. Exit with Honor: The Life and Presidency of Ronald Reagan. Armonk, NY: M. E. Sharpe, 1997.